"Tales from the Outer Country" is my first official album and a fourteen track collection of songs I wrote after moving from Minnesota to Kansas, where I first started learning about country and bluegrass music. I played all of the instruments on the recordings, produced it and drew the cover art, so this is a true DIY project. Creative freedom is far less limited in a home recording scenario so thankfully I'm able to safely explore musical realms that may not always resemble typical genres. You could call it country fusion, but I call it "Cosmic Western" and it is made up of classic country sounds, bluegrass techniques, gospel guitar harmonies, rock rhythms, and mysterious lyrics. I have been playing music for my whole life and it seems this is the first time I have something to show for myself, so I don't feel bad saying that it took me three and a half years to complete. Some of the instruments I still had to learn yet. Either way, I put my absolute best into this recording and sometimes you need to have a couple hundred takes until you feel nice and satisfied. I want to thank my family and friends for all the support they have shown throughout the years, my childhood piano teacher Yvonne Thomas, all of my fans and I would like to dedicate this album to my good friend Ryan "Abe" Abrahamson. "Tales from the Outer Country"
Gram Parsons meets Frank Zappa. 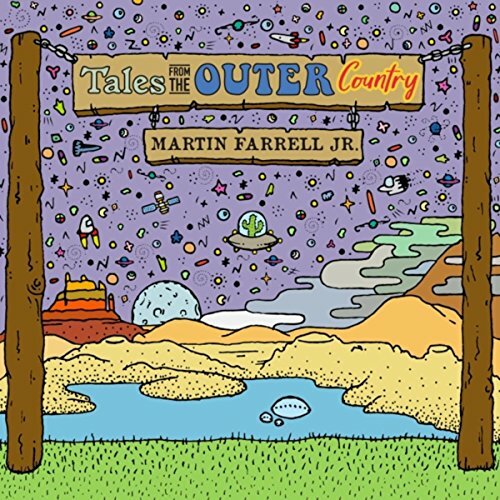 This debut release from multi-instrumentalist and producer Martin Farrell Jr. tells stories of heartache, drinkin', freedom and dyin' while painting wondrous musical backdrops for the listener to immerse themselves in.